Is price per gallon the best factor? Typical residential home heating oil tanks in New England hold 275 gallons of oil. 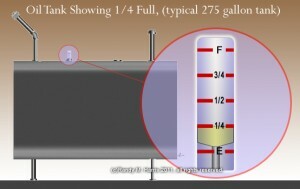 Most tanks have a small glass gauge on top showing quarter-tank increments. The last quarter of a tank is usually less than accurate due to sludge, sediment or water in tank. In the coldest months it is advisable to order oil any time gauge shows 1/4 or less. New England winters can be tough, and home heating fuel costs can make things even tougher. If you're like many people in the North Eastern U.S.A, you heat your home with oil, and recent surges in petroleum prices have caused your heating bill to double (or more) in the past few years. Due to seasonal fluctuations in pricing, many fuel oil companies offer programs to help spread the cost over the entire year. Others offer a low per-gallon "C.O.D." price. Before discussing "cost", knowing the oil company's lingo will help. Below are some of the terms used and what they mean. Cash (Price) - pretty much what it sounds like. This is the price per gallon a company will charge you if you are not on a scheduled delivery program and would like to purchase oil. Be sure to ask if the company accepts credit cards or personal checks if that is how you plan to pay. Some companies will deliver the oil and leave a bill to be paid with 10 days or so, and others will want "C.O.D", (cash on delivery), meaning you need to pay for the oil when it's delivered. Locked (Price) - if you decide to take advantage of a delivery program, some companies offer a locked rate on the price per gallon of fuel oil and guarantee that price for (avg.) 10 to 12 months. If price goes up (or down) you pay the locked price. Pre-Paid (Price) - (also called "Pre-buy" price), some oil companies allow you to pre-pay for heating oil, before you actually take delivery of the oil. The benefit of such a plan is that you are buying tomorrows oil at today's price. Obviously, this buying strategy is only effective if you are sure prices will either remain the same as the day you purchased the oil, or will rise, (if the price rises, you will save money -- if they remain the same, you wil lnot lose money, but if prices drop, you will in-effect be paying more, and paying ahead of time). Always check details of any pre-paid purchase agreement; inquire if your payment might go into an interest bearing account, or if the company offers any form of protection to pre-pay customers in the case where prices do decrease, (see: "Downside Protection" below). Capped (Price) - unlike locked pricing, capped pricing assures that you will pay "no more than" (the capped price), but you may pay lower if oil prices come down. Budget Plan - to help spread the cost of heating oil over the course of a year, many companies offer a budget plan where you make fixed monthly payments. Most budget plans offer a combination of locked / capped pricing, and usually include a burner service plan. Budget plans are usually only offered to home-owners with good credit. Monthly payments on budget plans are usually based on 10 equal monthly payments, then a final bill is adjusted to cover actual amount of oil used, (which may be over or under the estimated number of gallons which were included in the plan). Downside Protection - (also called "Downside Insurance"), some companies that offer locked prices also allow you to purchase "insurance" in case fuel oil prices come down and you are locked at a higher rate. Service Plan - (also called "Service Contract"), most companies that deliver fuel oil also provide service for your oil burner, (some also service oil tank, filters, thermostats, zone valves and circulators and other parts of the heating system). Most service plans include a yearly burner cleaning. Fuel Additives - some companies charge separately to add antifreeze and rust inhibitor to your fuel oil. While the cost is usually minimal if they do charge separately, knowing whether it has been added to your oil is very important. Without anti-freeze, one small drop off water frozen in your oil line can shut-down your heat on the coldest nights. Rust inhibitor will prevent rust from forming in your oil tank, lines or the burner itself -- again, one small particle of rust can shut down your heat. Annual Cleaning - knowing what is included in a burner cleaning is just as important as knowing you had any cleaning at all. Oil heating systems involve a storage tank which sometimes has a filter or water trap, the lines from the tank to the burner, another filter, the burner itself, and your chimney. Ask, and get in writing which parts of the system will be cleaned, and which if any parts or additional services are not included in the price. Knowing the lingo is just part of shopping for fuel oil. Do you need a service plan? Is a budget plan the best way to go? How many delivery trucks and service people does the company have? Are "emergency" service calls, (after hours or weekends), included? With so many factors to weigh, it seems difficult, but it's really pretty simple --- You are gambling, and there is virtually no way to guarantee that the best deal you find today will be so sweet a few weeks or months from now. What's best for you, may not be what's best for your next-door-neighbor either. To even the playing field, and be able to compare the various aspects of contracting with one company or another, (or opting for C.O.D. deliveries and shopping around each time you need oil), here's a few simple suggestions. 1. Shop for a year-round contract in early fall. Traditionally home heating oil prices are somewhat inline with gasoline prices. In New England gasoline prices go up in the summer due to high demand from vacation travelers, and (fuel oil) prices also go up in the winter when demand is high. You may be able to lock in a low year-round price if you take a contract in the early fall. 2. Always compare "per gallon" prices, don't just take a contract because it's calculated on a low cost monthly budget plan. You may get stuck with a huge end of year balance due if you use more oil than the budget plan allowed for. 3. If you have a new home, or a new heating system, you may want to consider C.O.D. deliveries. These traditionally cost much less per gallon for fuel oil, but do not include a service plan. Alternatively, if you have an older home with an older heating system, you should contract with an Oil Company which offers a 24/7 service plan and doesn't charge for parts or labor --- one service call and a few parts could wipe-out any savings you may get from buying C.O.D. So, how do you compare the various plans? First off, base your shopping on a realistic number of gallons of oil. Most companies keep records of how many gallons a customer uses. If you only used one company, or purchased a home from someone who did, you can simply call the company and ask, (it is also sometimes printed on bills or statements). For the examples here, we'll base comparisons on 1000 gallons of oil. If oil costs $3.449, (three dollars and forty four and 9/10th of a cent), per gallon, then the annual cost for fuel oil would be $3,449.00, (three thousand, four hundred and forty nine dollars). If you paid $0.20 (twenty cents) more or less per gallon, that would raise or lower the annual cost by $200.00 (two hundred dollars). Using the same math, if one company includes an annual cleaning if you become "a customer", (and the cleaning is valued at approximately $200.00), and another company charges C.O.D. pricing but charges $0.20 per gallon less, the two deals would be equal. You need to calculate the cost of the oil, a yearly cleaning, and seriously weigh whether or not you might need service. Again, one service call that is not covered by a service contract could cost more than you save buying C.O.D. Once you understand the basic cost per gallon pricing and know how much oil you use, you need to start comparing the various, "lock" and "cap" pricing. A budget plan is just a way to spread the cost out over the year instead of having high bills in the winter and little or no bill in the summer -- most companies do not charge interest or financing on budget plans -- they like you to be on a plan so they are guaranteed to get your business year round and so they will have steady year round income. The safest pricing plans are for a locked price per gallon. You know exactly how much you will pay regardless of market prices. To make locked pricing even more attractive, companies may offer downside insurance (at a small non-refundable fee), which insures that if prices go down, you will pay the lower prices -- but will not pay more than your lock price. Unless oil prices drop considerably, you should be able to get a fair year round price using this method. Capped pricing is similar to locked, except that you pay no more than "the cap" (price) --- if prices come down you pay less. You may wonder how fuel oil dealers can sell you oil for less than market price. Many dealer purchase their oil and store it for a year or more -- they know their costs, and can make a profit even at a locked or capped price that is lower than current market prices. If you are thinking of changing dealers, or experimenting with the various plans, ask each dealer the same questions, and try to contact several in the same day or within the same week. 1. What is today's cash price per gallon? 2. Do you offer locked and/or capped price plans? 3. Do you provide cleanings and service plans? 4. Do you offer budget plans? In the wake of the home heating oil price shake-up, several websites have sprung up to help consumers find information about home heating oil companies. Once you decide on which companies you may want to buy oil from, make a small table like the one below, and phone each company and ask questions. Don't worry that you are bothering them. Most fuel oil companys will quote today's price with no need to explain why you're asking. Companies that offer year-round delivery, service and pricing plans want your business and will ask if you would like more information about becoming a customer, (in oil dealer lingo; this means you buy all your oil for the year from them and only them). Many companies offer very attractive new customer pricing which can include free service or discounted pricing on oil and service. If you qualify, you may also ask if the company offers any elderly or disability discounts.